Survival gardening is a complex set of skills that takes time to learn, and it has a different focus than ordinary vegetable gardening (when you have a supermarket to fall back on). You will need to grow a different kind of food, focusing especially on producing calories, and crops with long-term storage ability. These all have to work together for success in survival gardening. I'll briefly cover each one, and point you to where you can find more information. Also see the Related Articles in the right column. How much food will you need to grow? How many people will you need to feed? When I first began vegetable gardening back in 1985, I started a spreadsheet to track what we ate. I put all the vegetables, dried legumes, and rice categories down the left, and the dates of each time I went grocery shopping across the top. I pored over the receipts when I came home from the store, and entered every amount in the correct box: 2.3 pounds of broccoli, 5 pounds of pinto beans, 5.8 pounds of onions, etc. We cooked everything from scratch. I did this for a full year, for two people. When I added it all up I was amazed at how much we actually ate. We would have needed a lot more land if we were to grow it all ourselves. We were vegetarians at the time. What I didn't take into account, out of ignorance, was our primary protein and fat sources: eggs and cheese. Years later I studied for several weeks with survival skills expert Tom Brown, Jr., and learned that to survive in the wild, humans simply cannot survive on plants alone. There aren't enough calories available from native plants in the wild, no matter how many you eat. This was a difficult realization for me and made me rethink how nature was set up. The point is, vegetarian or not, for survival you must focus on the calories you need to survive, and where they are going to come from. You may want to add chickens, ducks or goats into your plan. If so, also plan out how you will care for them without buying feed. This article is on survival gardening, though, so I'm focusing only on plant calories here. Potatoes, believe it or not, are relatively high in protein (for a vegetable), and they store well if kept very cool and very dark, and away from apples or other storage fruit. Winter squash is high in vitamins and starch calories. Some winter squashes store better and longer than others. “Sweet Meat-Oregon Homestead” is delicious, stores well, and can be cut into rounds and dried. If you pound up completely-dried squash and put it in airtight jars, where it will store indefinitely. Corn varieties are a broad topic. Sweet corn is good for eating fresh, but not so good for storing. Dried flint and dent corns are not so good for eating, unless you grind them or pound them into grits or flour. Some corns make better baked things, and some make better boiled things. So which type of corn you grow depends on how you plan to cook it, as well as where you live. Some varieties grow well in the north, others in the south. There are too many variables to cover in detail here, but Carol Deppe covers the topic of corn beautifully in her excellent book, The Resilient Gardener. Other than corn, small grains (rice, wheat, etc.) are too labor-intensive for the calories produced to be of practical value in a survival garden. Quinoa may be an exception. While not technically a grain, it requires no threshing and (for a plant) it is very high in protein. But in a survival situation, both protein and fat are critical concentrated energy sources, especially if you live where there are cold winters. Beans are easy to store, but rather labor intensive to grow and shell in survival-level quantities. They are good protein sources, though not very high in fat. Good bean varieties for drying and storing are “Jacob’s Cattle”, “Black Coco”and “Kentucky Wonder”. Sunflower Seeds are your best bet for fat from a survival garden. They are easy to grow and also high in protein. Use large-headed oily varieties, and make sure to protect the flower heads from the birds as they start ripening. Nuts are a great fat source if you happen to live where almonds, walnuts or (if you're really blessed) piñon pines grow. Obviously, these are long-term crops - not things you have time to grow from seed in a survival situation. All the crops listed above will store well if harvested and cured properly, and given the right storage conditions. Another related skill set to survival gardening is canning. My friend Sharon over at Simply Canning has all the information and resources you need to learn to safely can everything you grow or hunt. She's a canning master. 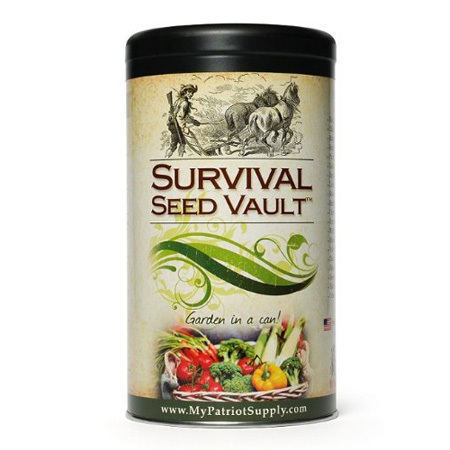 All seeds used in survival gardening should be "open-pollinated" varieties, which means that each generation will come back true to the parents. "Heirloom seeds" are open-pollinated varieties that have been handed down for generations. It doesn't matter whether or not your seeds are heirlooms, only that they are open-pollinated, so that you can save your own seeds for the following year. If you’re serious about successful survival gardening, there is no way around doing some calculations for your specific situation. Multiply how many plants you're going to grow, by how much space each requires, for every crop you plan to grow. This will give you a ballpark of the total square footage (or acreage) you’re going to need. Don’t forget to include the paths between beds or the space between rows. This brings up the question of gardening methods and sustainability. Wood-framed raised beds may be beautiful and enjoyable, but unless you already have a bazillion of them built, they are impractical and unsustainable for survival gardening. They require heavy inputs of lumber and potting mix up front. Even in ordinary supplemental gardening, they are completely unnecessary. For survival gardening I recommend that you learn how to double-dig French intensive raised beds. In a rapidly-unfolding survival situation, you probably won't be double-digging a half acre. But learning this method will serve you very well over time. French intensive beds require no inputs other than sustainable, locally-generated compost and wastes. 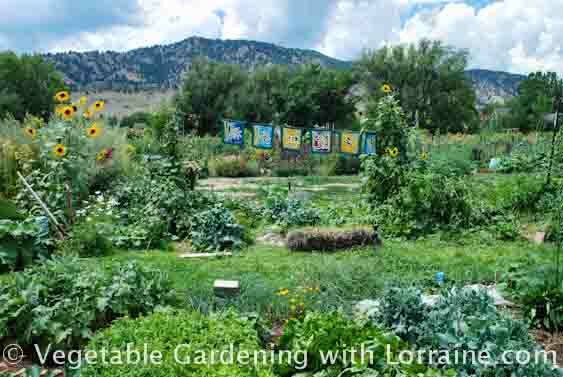 You don't need a rototiller (or gas), and French intensive gardening has been scientifically proven to be the most efficient and productive growing method there is. Period. Even if you only single-dig and mulch heavily to enlist earthworm help, the method is both workable and sustainable indefinitely. The other aspects of survival gardening listed above are covered in detail in the related articles over on the right. Becoming a skilled gardener will change your life for the better, whether or not you ever have to fall back on your garden for survival. Hone your skills now and harvest the rewards now: health, strength, steadiness, patience, humility, gratitude, greater self-sufficiency and attunement with nature. The doorway to everything from Artichokes to Zucchini!